Winston-Salem, NC is the product of the merging of the two adjacent towns of Winston and Salem. This consolidation occurred in 1913. The city is located in the northern half of the state of North Carolina, about 10 miles northwest of Clemmons, NC. According to the 2010 census, the population of Winston-Salem was 229,000 but has since grown and is now estimated to be approximately 239,000. The climate in Winston-Salem is considered to be a humid subtropical climate. This is characterized by hot humid summers and cool winters accented by moderately cold winters from time to time. The average low temperature from October through April dips as low as 28 degrees and does not top 50 degrees until May. These extreme temperature changes make it important to properly maintain heating and air conditioning systems. 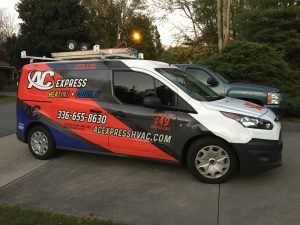 AC Express Heating & Cooling LLC specializes in heating repair, heat pump repair, and air conditioning repair. We service the Winston-Salem, NC region and look forward to servicing all of your heating and AC repair needs. Call us today for more information.